creates shipping labels which carriers like UPS and FedEx require, but what if you want to add your company logo to your shipping labels so your customers immediately recognize who the package is from? With Custom Documents, you can create templates that include the carrier-required shipping label and your own items as well. to elements on your template, so you create documents that pertain to particular shipments. 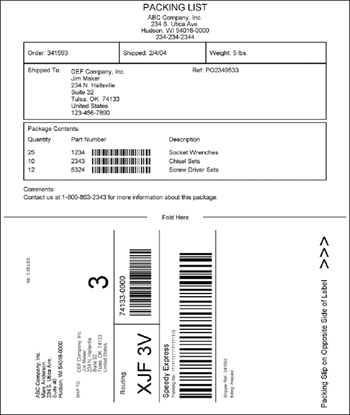 You can also use Custom Documents to create shipping labels and other documents for carriers that you define. You can also embed standard carrier labels and other documents into your custom document. 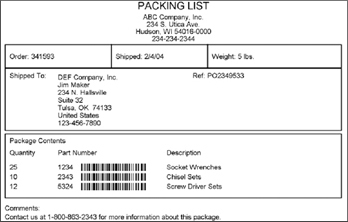 In this example, the top half of a standard 8.5" x 11" document is a packing list, and the bottom half is a shipping label which is also a custom document! With the right kind of label stock, you can even create a shipping label which peels off of the packing list and sticks to the package.